ARRA News Service: Americans Now Trust Republicans More Than Democrats! Americans Now Trust Republicans More Than Democrats! Rasmussen Reports: Voters now trust Republicans more than Democrats on six out of 10 key issues, including the top issue of the economy. The latest Rasmussen Reports national telephone survey finds that 45% now trust the GOP more to handle economic issues, while 39% trust Democrats more. This is the first time in over two years of polling that the GOP has held the advantage on this issue. Voters not affiliated with either party now trust the GOP more to handle economic issues by a two-to-one margin. Republicans also now hold a six-point lead on the issue of government ethics and corruption, the second most important issue to all voters and the top issue among unaffiliated voters. That shows a large shift from May, when Democrats held an 11-point lead on the issue. 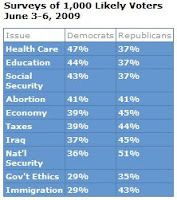 Tags: Democrats, public trust, Rasmussen Reports, 2009, Republicans To share or post to your site, click on "Post Link". Please mention / link to the ARRA News Service. Thanks! Obama has extended the recession an provided only platitudes when asked to explain why billions of dollars are necessary to bail out companies that made poor decisions. The Obama/Biden administration is a comedy of expensive errors. Such a great poll for the TRUE Americans. Just wait Bill - it's going to get even better! Yeah!! Come on America keep rubbing those eyes and waking up!!! Thanks for posting this one, too!! Probably just switched to a different flavor of Koolaid. The Republicans are no more trustworthy than the Democrats on the economy. Let's not forget who started the bailout mania. (assembling soap box and standing on top) I'm going to whine for a minute - something I never do (ha ha ha). I am "up to here" with the word "change". Unless I missed something MAJOR along the way, Term Limits for US Presidents has NOT been changed. George W. could NOT be elected again no matter WHAT. "Change" following the 2008 Election was a "done deal" . . . we were going to get "change" no matter WHO was elected. We better WAKE UP and shake off the shock . . . I do NOT want the government deciding for me whether my life is worth anything or not, and we WILL have health care rationing with Socialized medicine. This is proven over and over by what has happened in countries that have had Socialized/Nationalized/Universal health care for long enough to start throwing it out!! I return you to your morning coffee.